Spa clothing for the aesthetician and/or cosmetician that is reasonably priced and good quality is found within the TEKA family of spa products. Sizes range from xs to 3x. Colors range from spa white to spa black. 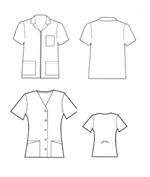 Coats, 3/4 coats, jackets, zipper tops, button and V-neck are represented. Call for particulars. Two styles to choose from: Unisex White Zipper Top - in sizes S or XL. Womens - snap front in black, form-fitting rear tie available in S, M, L, XL. 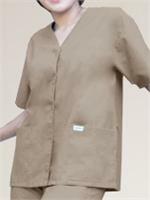 A functional snap front v-neck Short Sleeve Tunic in beige, white or black. Two side seam pockets compliment holding needs. Matching snap closures complete the simple beauty of this esthetician top.